With China a key foreign policy issue in the 2012 presidential contest, and both Barack Obama and Mitt Romney promising to “get tough” with the Asian power, the American public expresses both positive and negative views about China and U.S. policy towards it. Nearly two-thirds describe relations between the U.S. and China as good, and most consider China a competitor rather than an enemy. At the same time, majorities say the U.S. cannot trust China and that the Asian nation does not consider the interests of other countries when making foreign policy decisions. When it comes to dealing with China, as many say being tough with China on economic issues is a very important priority for the U.S. as say the same about building a strong bilateral relationship. Despite generally positive assessments of U.S.-China relations, Americans are clearly concerned about China’s growing economic strength and its impact on the United States. Most consider the large amount of American debt held by China, the loss of U.S. jobs to China and the U.S. trade deficit with China to be very serious problems, and about half say the Asian nation’s emergence as a world power poses a major threat to America. In contrast to the general public, American foreign affairs experts are far less concerned about China’s rising power. 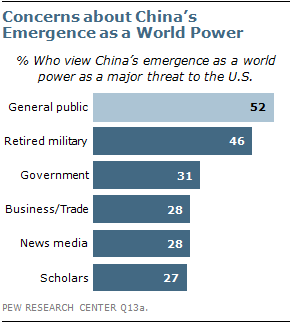 With the exception of retired military officers, only about three-in-ten among the experts surveyed consider China’s emergence as a world power to be a major threat. Fewer than four-in-ten experts consider the U.S. trade deficit with China to be a very serious problem, compared with about six-in-ten of the broader public; and even fewer experts express concern about the loss of U.S. jobs to China. Moreover, unlike the general public, experts are far more likely to support building a strong relationship with China than to back being tough with Beijing on economic issues. The public and experts also offer divergent views of how assertive America should be in the world. When asked whether the U.S. should play a shared leadership role, be the single world leader, or not play any leadership role, majorities of the public and experts choose a shared leadership role. Among those who do so, 62% of the public say the U.S. should be no more or less assertive than other leading nations. In contrast, majorities of retired military officers, scholars, government officials, and business and trade leaders who favor a shared leadership role say the U.S. should be the most assertive of the leading nations; views are more mixed among members of the news media. These are among the key findings of a survey of U.S. foreign affairs experts in government, business, academia, the military and the news media and the American public conducted by the Pew Research Center’s Global Attitudes Project. The survey is part of the broader U.S.-China Security Perceptions Project, conducted in collaboration with the Carnegie Endowment for International Peace, the Kissinger Institute on China and the United States at the Woodrow Wilson International Center for Scholars, the China Strategic Culture Promotion Association and the Research Center for Contemporary China at Peking University. 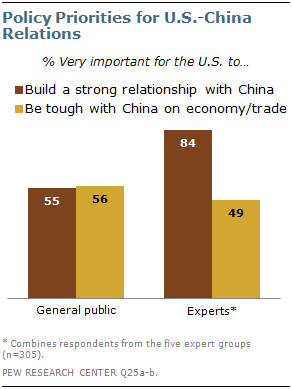 The American public, as well as majorities across the five expert groups, describe China as a competitor of the United States. Few see China as either a partner or an enemy. However, the public is more likely than the experts to label China as an enemy; 15% of the public offer this negative view, compared with 3% or less among the five expert groups. 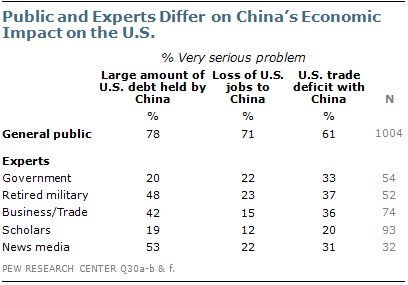 China is also largely seen as untrustworthy by both the American public and the experts. 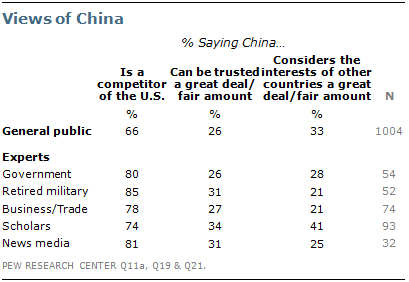 Only 26% of the public and about a third or less across the expert groups surveyed say the U.S. can trust China a great deal or a fair amount. By comparison, at least half among the public and the experts say the U.S. can trust Britain, Japan, France, Israel and India. Moreover, just one-third of the public and even fewer among most expert groups believe China takes the interests of other countries around the world into account when making foreign policy decisions. Scholars are more likely than other foreign affairs experts to say this, but 59% in that group say China does not consider the interests of other countries. By comparison, solid majorities among the public and experts believe the U.S. considers the interests of other nations. 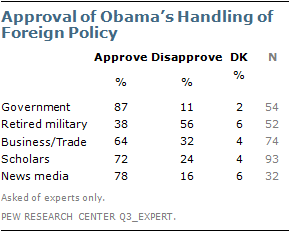 Nearly nine-in-ten government officials, and at least six-in-ten members of the news media, scholars, and business and trade leaders, approve of the way Obama is handling foreign policy. However, Obama receives lower marks among retired military officers, with a majority saying they disapprove of the president’s performance. Asked to assess the Obama administration’s handling of China in particular, retired military officers also express more critical views than their counterparts. About half of retired military officers say Obama is not being tough enough with China, while 35% say his policy is about right. In contrast, majorities among the other four expert groups endorse the administration’s handling of China, including about two-thirds or more of government officials, scholars, and the news media. Among the public, slightly more say Obama is not being tough enough with China than say his policy is about right (45% vs. 39%). Republicans are nearly twice as likely as Democrats to say the president should be tougher (65% vs. 35%); 49% of independents think Obama is not being tough enough with China. 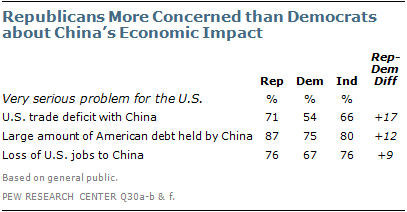 Republicans are considerably more concerned than Democrats about the impact of China’s rise. Six-in-ten Republicans believe China’s emergence as a world power poses a major threat to the U.S., compared with 48% of Democrats. Moreover, far more Republicans than Democrats see the U.S. trade deficit with China, the loss of U.S. jobs to China and the large amount of American debt held by the Asian nation as very serious problems. Republicans are also far more likely to favor toughness with China on economic and trade issues, while Democrats are more likely than Republicans to say building a strong relationship with China is a top priority. About two-thirds of Republicans (68%) say it is very important for the U.S. to be tough with China, compared with 53% of Democrats; 48% of Republicans believe building a strong bilateral relationship should be a top priority, while 59% of Democrats offer this opinion. Americans view China primarily as an economic threat rather than a military one; 59% say the Asian nation’s economic strength worries them the most, while 28% say its military might is a greater concern. Majorities across all expert groups believe China will become more democratic as a result of economic growth. At least seven-in-ten Americans describe the Chinese people as hardworking (93%), competitive (89%) and inventive (73%). Most also associate these traits with the American people, but fewer say Americans are hardworking (78%) than say the same about the Chinese. About a quarter of the public (26%) names China as the country that represents the greatest danger to the U.S., more than volunteer any other country; 16% name Iran and 13% cite North Korea as the greatest danger. Opinions of which country represents the greatest danger vary across the five expert groups. Most experts would support the use of U.S. military force to defend Taiwan if China used military force against the island without a unilateral declaration of independence by Taiwan. If an attack from China followed a unilateral declaration of independence, however, half or more would oppose the use of U.S. military force to defend Taiwan. Majorities across the five expert groups say the world will be more stable in the long run if the U.S. remains the dominant power, but sizeable minorities, including 45% of business and trade leaders, say a balance of power between the U.S. and China would lead to more stability.